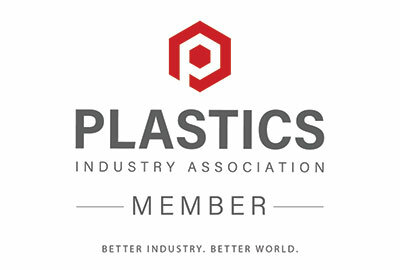 Thin plastic films are inherently difficult to measure due to their possibility to deform when pressed and due to the thinness of the material relative to accuracy of physical measuring techniques. They are often less than 1 mil or 25 microns thick. Many producers try to use a micrometer since it is a simple and inexpensive solution. 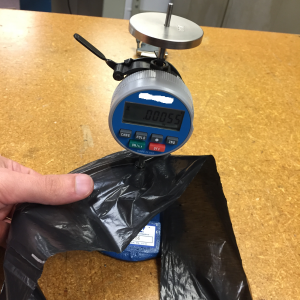 However, with thin plastic films, there can be some real challenges on repeatability and reproducibility with a physical measuring technique. In this study, we look to quantify these differences, and to do so, we performed two blind R&R (Repeatability and Reproducibility) experiments. We first used a micrometer to take readings in ten locations on a loop of blown film that was approximately 0.8 mils/20.3 microns thick. Three different operators performed the test twice at the same ten different points on the film. The readings were recorded by a computer so the operator could not see the values as he/she was measuring the sample. 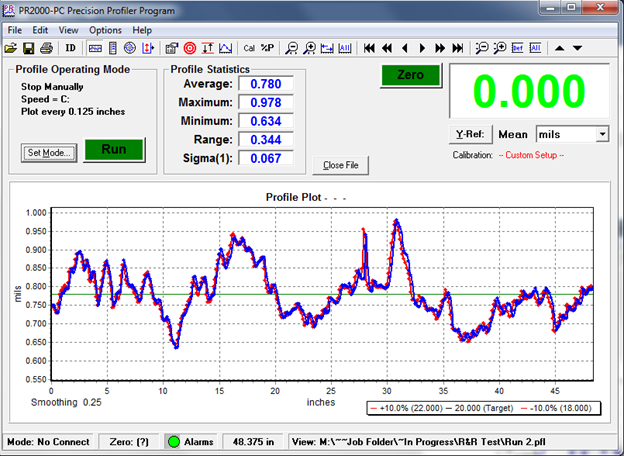 We then repeated the same test using SolveTech’s Precision Profiler™ Model PR2000 in SpotPlot™ mode. The PR2000 is typically used to profile plastic film continuously, but it offers this special mode to check individual spots similar to a micrometer. This mode was good option for this comparison. 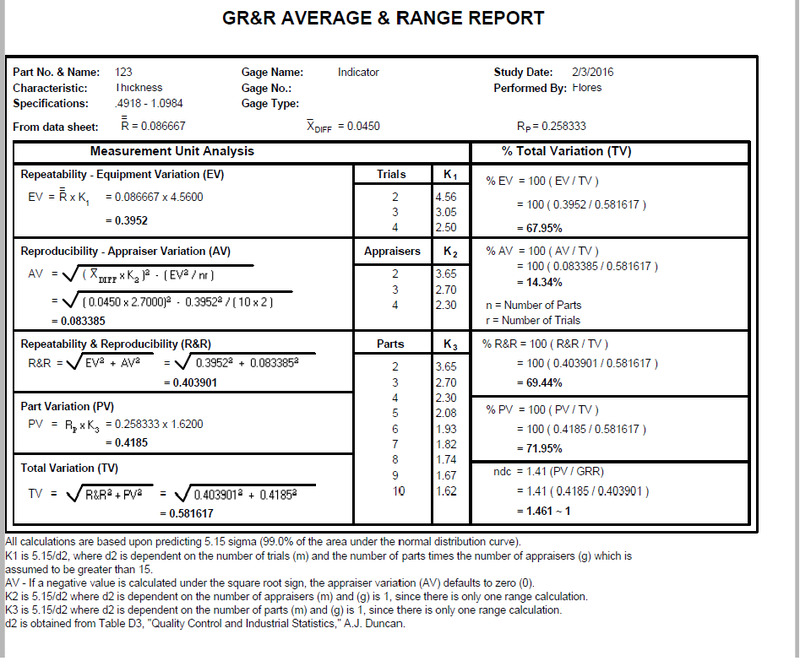 There are three resulting percentages for R&R that quantify how much error is occurring in the measurement: the error due to the device, the error due the operator, and the combination on these errors. It is therefore critical that the equipment both have an accurate measurement and that the equipment perform that measurement consistently when switching operators. The Datalyzer Gage Management Software was used to take the data and convert it into these results. For the PR2000, SolveTech combined their market leading performance of their non-contact capacitance sensor with an easy to use interface that automatically flattens the film consistently with little operator intervention. As a result, the overall R&R was only 3.06%. Reproducibility is the variation between the users, and here it was found that for the PR2000, the operator only contributed ~0.5% to the overall variability. For the operator Ping, this was her first time using the instrument, so this really shows how the instrument is designed to greatly reduce the impact of the operator. Repeatability is a measure of the equipment variation and was found to be 3.02%. When using a calibration frame, the PR2000 is typically repeatable to +/-0.001 mils/ 25 nanometers, but when dealing with plastic film, it can be difficult to measure in the same exact location and hold the film perfectly flat when not in a frame. These two factors contributed to the variability being about 3% for the PR2000. For the micrometer, the overall R&R was 69.44%. Since this was a handheld device, the operator was more of a factor causing a reproducibility of 14.34%. For the micrometer, the repeatability was 67.95% due to the accuracy of the device (~0.05 mils) relative to the overall variation of the film. Note: To determine overall variability, the PR2000 Profiler was used in profiler mode. The graphs are presented below. They were run twice to verify R&R of the runs. The graphs are overlaid and compared to determine this, and it is shown below. When dealing with a film as thin as 0.8 mils, a micrometer is clearly pushed past its limit. The micrometer has a weight, and it tries to consistently drop the probe on the film. However, this is difficult to do, and many times, the different operators may do this slightly differently. It also typically does not have an accuracy that is an acceptable percentage of the overall material thickness. Industry experts consider an R&R of 10% or lower acceptable. If the R&R is above 30%, the device is not considered acceptable. Learn more about R&R here. The PR2000 had more than acceptable R&R results at 3.06%, while the micrometer had an unacceptably high level of error. With an R&R of 69.44%, the micrometer fails to be an effective device for the application. The PR2000 however is able to perform quite well as it is an advanced gauging system specifically designed for measuring thin films. This results of this study show why many companies chose to invest in SolveTech technology for measuring the quality of their films. The PR2000 has 50x higher accuracy (0.001 mil vs 0.050 mil) than the micrometer, and it is really needed in thin film applications. Note: A micrometer can still be used as a rough general indicator of film thickness, however this study was to determine its usefulness in studying material variability. Select a generic trash bag made from blown film for analysis. Cut several strips of the material from the same trash bag as the measurement sample. A gas pycnometer was used to find the density. 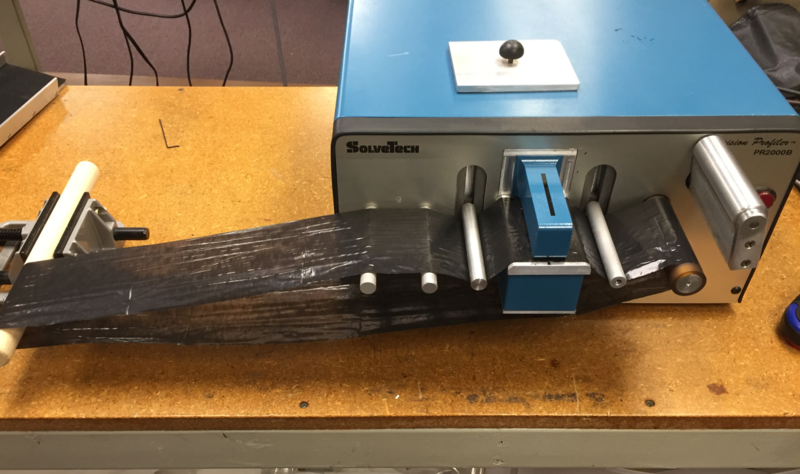 The strip of plastic was run in the PR2000, taking a data point every 0.125”. The strip was measured and weighed. The average reading of the data points is set to match the calculated average thickness of the material. This is a highly accurate calibration typically accurate to 0.2% and NIST traceable. This calibration recipe is then saved for future use. For the purpose of the R&R study, the upper and lower limits of the material were determined. The PR2000 scanned the strip at 1 in/sec, taking data every 0.125” which measures every section of the film. This was run twice to validate the results and to offer another opportunity to understand the repeatability of the PR2000 on this material. Spot data is used for the formal R&R analysis. Data was first collected with the PR2000 and then the micrometer. The film was marked in 10 locations so the device would measure the film in the same location. The operator could not see the reading of either instrument so it was done blind. These data points were first stored in the PR2000 Software, and then entered into an Excel format. 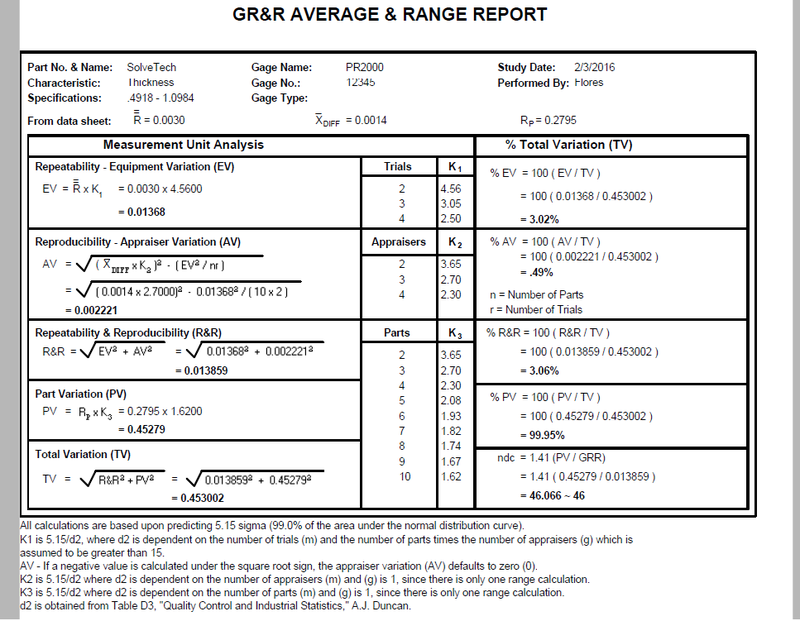 Data Analysis: The value were entered into Datalyzer Gage R&R software to get the final results. Below is the data collected for the experiment. Thank you for taking the time to understand this report. If you have any questions, please contact SolveTech at info@gauging.com or call at 302-798-5400.